While the exterior received a few minor updates, the interior has been heavily revamped. The plastic quality remains more or less the same as it was before, but it now sports an all-new, dual-tone dashboard. Not only is the layout here a lot cleaner, it does feel like the in-cabin experience has been uplifted. The centre AC vent design has been changed as well and they are now a part of the the top layer of the dashboard. Unfortunately, the steering still isn’t adjustable for rake or reach but is now finished in a better-looking black colour. There is a brushed aluminium-like plastic cladding, which makes it look more premium. A value addition that’s been missed here is steering-mounted audio and telephony controls. Including at least one of the functions would’ve added a great deal of convenience, especially since the GO+ now gets a serious upgrade when it comes to in-car entertainment. The instrument cluster is new as well, but may look familiar as it is borrowed from the Micra. When compared to the outgoing models, the new versions get an analog tachometer on the left. The small orange-backlit MID (multi-info display) at the bottom displays the odometer, tripmeter, distance-to-empty, time and fuel level. Strangely, there is no lane change indicator, which is a very basic yet useful feature.Now, we come to a major highlight of the new GO+: the in-car entertainment. The centre console now features a 7-inch touchscreen infotainment system. Nope, it’s not the same unit we’ve seen in other Renault cars like the Kwid or even the Captur. This new system is responsive to use and features crisp graphics for menus. Yes, it also supports Android Auto and Apple CarPlay connectivity apart from the usual USB, Bluetooth and Aux inputs. The screen itself is compatible with a rear camera, although you will have to buy the camera separately as it’s not included in the GO+ features list. Sadly, the sound system itself hasn’t seen a corresponding upgrade. The two-speaker setup offers disappointing audio quality, which doesn’t complement the experience you get with the touchscreen. Below the touchscreen are knobs for the manual AC. The USB and Aux-in ports are placed a bit oddly on the panel below the gear shifter, away from the line of sight.The gear lever is no longer a ‘floating’ unit as there is the centre console compartment going all the way to the bottom. Thankfully, following customer feedback, the dash-mounted handbrake lever has been removed, replaced with a conventional lever between the seats.The seats themselves have been reworked. Datsun has added what it calls ‘Anti-Fatigue Seats’ which aim to deliver better comfort, especially for long drives. This is an important touch, since Datsun’s cars are quite popular in hilly regions, where the tough terrain can turn short journeys into long ones. Fortunately, these seats feel well cushioned and support your back even quite well. However, much like the steering, the seat is not adjustable, which can make finding the right driving position a little tricky. On the plus side, you now get electrically adjustable ORVMs, which add a much needed dose of convenience. Although the rear seat offers adequate headroom and legroom, you sit a bit low with your knees pointing upwards, which gives you the impression that the seats lack under-thigh support. That said, the shoulder room feels wider than cars in its category and is just enough to squeeze three average-sized adults, albeit for shorter journeys. A few little misses remain, though. The headrests, for example, are fairly small and non-adjustable. There’s no rear armrest either, nor do you get seatback pockets.With the 2018 GO+, the third row experience remains exactly the same as before. There is no way adults can fit in there comfortably and it is best suited for small children. An expected compromise when you try to fit 7 people in a car that’s no larger than a family hatchback. It lacks headrests and AC vents too. Also, you only get lap belts here. In our opinion, it’s best to fold or completely remove the third row and use the additional boot space (347 litres with third row folded) it offers. The Datsun GO+ continues to be powered by the same 1.2-litre, 3-cylinder petrol engine as before and there is no diesel motor on offer. This engine produces 68PS and 104Nm of torqueWhile the output figures haven’t been altered with the update, Datsun’s engineers have made revisions to the gear ratios of the 5-speed manual box in order to improve driveability. As a result, the car still feels peppy, with the engine pulling strongly from 2000rpm onwards. Of course, this isn’t a car meant for pleasing the enthusiasts, but with a claimed 0-100kmph time of 13.3 seconds, the GO+ is supposedly as quick as the Ignis petrol AMT. We’ll put the car through a road test to verify these figures. However, it does look like the added weight has had an impact on the driveability of the GO+, even with the altered gearbox ratios. It’ll still pick up from 30kmph in fourth gear without the engine knocking, but there is a l-o-n-g wait before the speedometer starts to climb again. This becomes apparent when the car is running on a full load, forcing you to provide a heavy throttle input to get going. As expected, the powertrain’s tuning is primarily for city commuting.On the highway, it’ll click 100kmph but does run out of breath if you try to make it go much faster. High speed overtakes also require some planning. Overall, though, the Go+ still retains its capabilities as a daily driver. At 19.83kmpl, the claimed fuel efficiency is now slightly lower than before but still very impressive standalone. The Datsun GO+ gets a 10mm bump in ground clearance (now 180mm) thanks to the larger 14-inch wheels. To account for the different wheels and subsequent clearance, the suspension has also received some tweaking, and we’re happy to report, the tinkering has worked for the better. The suspension takes on speed breakers and undulations with ease, and cushions you well.This characteristic is even retained at highway speeds as the car remains stable over broken roads, undulations and bad patches. What impresses most, though, is that the car is quick to settle down after hitting a pothole or bump. None of the bouncy aftershock you’d expect in comfort-set suspension. At triple-digit speeds though, it does feel a bit bouncy, hinting that whether it’s the engine or suspension, the Go+ prefers low to medium speeds. Another improvement can be noted in engine noise insulation. The motor isn’t as audible as it was before. However, the floorboard insulation still feels lacking as even the smallest pebble hit makes a sharp noise inside the cabin, something you will get annoyed by over roads that are still under construction. But overall, the NVH levels have improved to a point where it is now acceptable.The handling package offers nothing unexpected. The steering is light and lets you make quick turns or u-turns in traffic. However, there isn’t much by way of communication from it and it feels a bit vague at high speeds. Go for sudden lane switches and there is some guesswork involved, which can be unsettling. A slightly heavier steering would have gone a long way to help with that. Body roll never becomes an issue inside the city, but you will feel it in the GO+ on the highways. Driver airbag and manual central locking are available only on the top-spec variant. Other features such as 3 point ELR front seat belts, second row seat belts, third row seat belts, child lock and engine immobilser are standard on all trims. It’s good to finally see Datsun taking some action to improve its notoriety when it comes to safety in India. For starters, the structure of the GO+ has received a good deal of reinforcement. 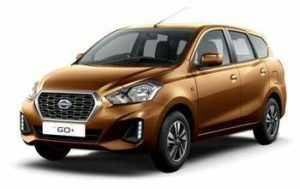 In the process, it has gained about 150kg in weight and Datsun claims the GO+ will comply with the upcoming Indian crash test norms.What’s more, not only do you now get dual front airbags, ABS with EBD, brake assist and rear parking sensors, all these features are included as standard even in the base variant. Yes, follow-me-home headlamps are also included as standard.